We received the item yesterday. It’s great. In perfect condition. Thank you so much. I can’t believe you found it for us. We really appreciate it. My son has become very close to his “bun bun” (which is really a puppy and not a bunny). But we had a fright last week when he misplaced it, and he screamed and cried for over an hour, because he couldn’t fall asleep without. My daughter has the pink one (which she doesn’t even pay attention to), so we tried giving that to him, but he just kept throwing it out of his crib. After two hours of a frantic search, we finally found bun bun, and we decided it’s time for a backup. I searched all over the web, called Geoffrey Inc (Toysrus the manufacturer), told the entire family from the East to the West coast, and even friends in Hong Kong (in case they are made in China) to keep an eye out for it. My son is such a good boy with a heart of gold and got very sick when he was first born with Strep B. He spent two weeks in the NICU and two weeks in the pediatrics ward. He loves this bun bun soooo much. He carries it everywhere. He feeds it, plays with it, sleeps with it, chews on it and snuggles with it. I really need a back up in case he misplaces it again. 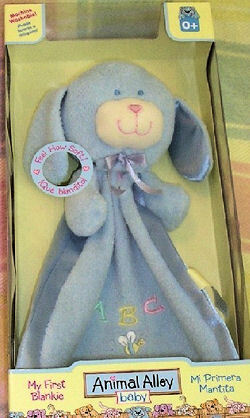 I don’t have a product item code, but I do know it’s from Animal Alley Baby, and it’s called “My First Blankie” and it’s a blue puppy with ABC embroidered on it. As mentioned above, no substitutions will be good enough. I am looking for the same blue puppy by animal alley. I just found 2 on ebay for buy it now. Hope this helps! !